Searching the web with Google is a part of almost everyone's daily routine. It's easy to find any information you could want in just a few keystrokes. But have you ever wondered just how search engines like Google actually work? Let's take a look at the inner workings of Google and see how it knows how to find what you're looking for so efficiently. It might surprise you to know that when you search on Google, you're not really searching the entire internet. Instead, you're searching Google's index of the internet. There are billions of pages on the internet. If Google had to scan through them all every single time you searched for something, it would take forever. Thus, Google keeps a database of websites that it can search in a fraction of a second. This is similar to the indexing process on your local computer, but on a much larger scale. To build this index, Google uses a variety of methods to crawl, which is the process of finding new webpages. It does this mainly through a bot (also called a spider), titled Googlebot, that systemically looks at websites and adds pages to Google's index. Google's bots use a variety of methods to figure out what pages to crawl. Sometimes they follow sitemaps submitted by website owners. Other times, they discover a new page by following a link on an existing page. This happens constantly, as new webpages are added to the internet all the time. The more important a site is, the more often Google will crawl it. In summary: Google uses automated programs, called bots, to scan for new webpages and add them to its index. This process is called crawling. Once it has the raw website data, Google integrates this into its index. This process involves categorizing the page's content, images, and context. Google's algorithms are quite good at determining what a website's purpose is. Now that it has the website all sorted out, Google can query that information in a short time. As you can imagine, storing all this data takes an enormous amount of space. In summary: After crawling pages, Google analyzes them and stores them in its database for future retrieval. Finally, when you search for something, Google has specialized algorithms to determine what the best fit is. Sometimes, this is easy. For example, if you search for "Microsoft", it's pretty obvious that you want to visit Microsoft's homepage. But for more advanced queries, Google considers many factors in serving you the best page. The company is always tweaking how it works to help get you the best page in the quickest time. It considers factors like how trustworthy the website is, how often it's updated with new content, how fast it loads, how many other sites link to it, and similar. For some searches, Google even takes local factors into account. For instance, if you look up "sushi restaurants", Google will show places in your region because you likely don't care about restaurants that are a thousand miles away, even if they match what you searched for. In summary: Google uses a proprietary algorithm to determine the best match in its index for your search query. What we discussed above only covers organic search results. These are the natural rankings Google determines based on the quality of a page and its relevance to what you're looking for. Essentially, companies who want to advertise on Google select the keywords they want their ads to appear along. If you ran a café, you might want to advertise on the term coffee shop, for example. When a user searches for that term, Google internally runs an "auction" to decide what ads will appear for the user. Each potential advertiser decides how much they're willing to "bid" for their ad to show up. They only end up paying if someone actually clicks the ad, however. Now you have an idea of how Google processes so many web pages in under a second when you search for something. Of course, this is only a surface overview. Google is always making changes to how it determines webpage quality and search relevance. And much of the exact detail is unknown. Additionally, the company introduces new features to help users better get to where they want to go. 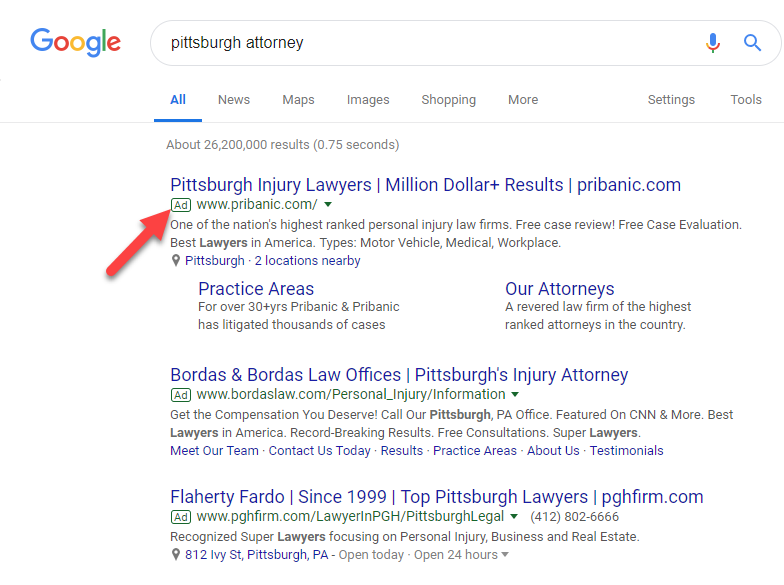 As an example, you may have seen the Instant Answers feature, which pulls relevant text from a website to answer someone's question without them even leaving the Google results page. Google is the premiere search engine for a reason, as they've led the way in this field for decades. It will be interesting to see where it goes next!